The dermatologist, allergist and physician Lueder Jachens offers wise advice in this helpful and expertly written handbook. His concern is not just to offer understanding of the individual conditions, their causes and how best to treat them, but to give a holistic comprehension of the skin itself - this largest of the human organs - to better enable us to develop health and harmony in the longer term. 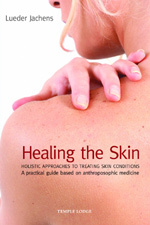 Jachens' authoritative guide begins with an anatomy of the skin and its relationship to the physical and spiritual levels of existence, and goes on to study various specific conditions and their treatment, including psoriasis, dermatitis, acne, boils, hayfever, alopecia (hair loss), melanoma, abscesses, impetigo, fungal infections, herpes, scabies, head lice, sunburn, and much more. LUEDER JACHENS, MD, born in Bremen in 1951, participated in anthroposophical medical student groups whilst studying medicine in Goettingen and Kiel. He specialized in dermatology and allergology, then worked in medical departments at an anthroposophical hospital. He has worked in private practice as a skin specialist in Stiefenhofen/Allgaeu, Germany, from 1992, and developed the Christophorus Medical Centre in Stiefenhofen.